IT’S ANCIENT KNOWLEDGE THAT THE CLIENT IS ALWAYS RIGHT. Yet, so many businesses still fail to educate their frontline personnel to use customer feedback constructively, rather than neglect it or, even worse, take it personally and transform an apparent innocent discussion into an “I’m right – you’re wrong” dispute. What does it mean that the customer is always right? it means that, even when clients are technically wrong (as they often may be), your employees should still acknowledge their opinion and do their best to deliver to expectations or at least communicate in a specific way that their requests are taken into consideration. Your staff should acknowledge customers’ opinion and do their best to deliver to expectations. The business’ job is to provide value to their clients in a manner that the clients perceive they receive value. This is so often forgotten by both small business owners and their employees. For example, for a restaurant, it might be true that the client had the same fruitcake the previous time she was there, but if she says that the previous time it was sweeter. This simply means that she is looking for a different tasting experience and she is indirectly asking for a suggestion. The waiter’s job is to satisfy this new sweet craving by recommending another cake, rather than enlighten the client about what she really had the previous time. This is a simple way to stay focused on the opportunity (up sale) and avoid a dispute. What do we learn from here? The employee needs to be able to read between the lines and to understand what the client really wants. This is a skill that the company needs to teach because most people don’t have the level of empathy to really put themselves into the client’s shoes and understand the need behind the request. When I was first asked to deliver a training on communication and talk about such issues, I wondered what the point was, as this is common sense. So if you feel the same, here is the news: don’t assume that something that is easy or common sense for you is the same for your employees. Because we are all different. And you may have some skills which your employees need to develop. The good news is that everything can be learned. 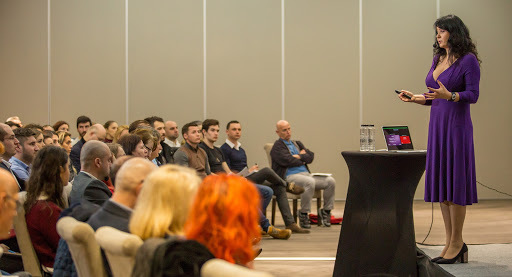 If you are interested in the training where show people how to become better communicators so they can easily make clients happy, click here. Shrugging off an unreasonable complaint is bad for your business: your staff gets used to shrugging off complaints (unreasonable and reasonable), your customers won’t return to your premises and the ones that still want your special treat won’t go into “feedback-giving-mode”, anticipating an unfriendly response. Unsurprisingly, the best server is not the one that is always right but the one who knows how to receive, respond to and help managers use customer feedback to improve your services. Acknowledging your clients even when they’re wrong doesn’t mean you are living a lie. It simply means that you are truthful to your foremost objective: being successful in a customer-centered business. If you want to train your employees to communicate better amongst themselves and with your clients so everyone is happy and more fulfilled, this training may be for you.